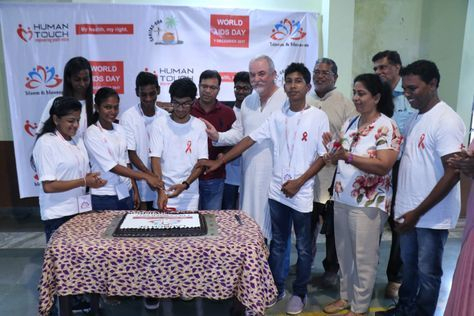 On World AIDS Day 2017, the Human Touch Foundation brought together adolescents living with HIV, representatives of NGOs, and government officials at ASRO, Tivim on 1 December. 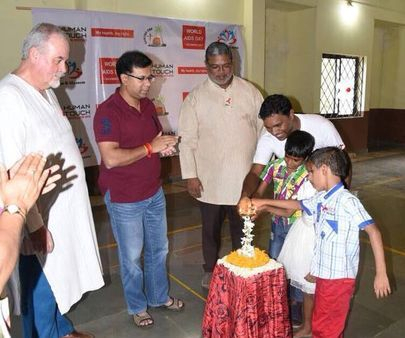 The event saw the launch of Bloom and Blossom, a club for adolescents living with HIV, by Honourable Minister for Health and Women and Child Development, Government of Goa, Shri Vishwajeet Rane. The adolescents made a presentation on the outcome of the consultation organised by Human Touch and Youth LEAD and shared their experiences of the TeenGen Leadership Course held at Bangkok, besides conducting a cultural programme. Fr Maverick Fernandes, Director of Caritas Goa, spoke on the work by faith-based organisations in response to the needs of children and adolescents. ‘I acknowledge all the people who have been supporting us, including the government, in this initiative. We are determined to coordinate a response with others, including the government and give care, love, and protection to those in need,’ Fr Maverick reflected. A unique club of adolescents living with HIV, Bloom and Blossom, was launched during the programme. ‘The concept of a club for adolescents is to provide a safe space for them to receive treatment and to ensure that healthcare is optimised,’ explained Peter F Borges, CEO of Human Touch. He emphasised the need to tend to their emotional needs at this critical time in their lives where establishing peer relationships is particularly important. ‘We face great difficulties in having our voices heard. We need that seat at the table. We want to speak about our issues. We want those working for us to engage us to drive the response,’ expressed Shanku who is president of the newly launched club. He detailed the issues faced by adolescents with HIV in accessing care and support, and coping with HIV, presenting the same to the Health Minister. Speaking on the occasion, Shri Vishwajeet Rane said, ‘You are special children, and I will do whatever I can to help you cope with better quality of life and will consider facilities needed in the health system. Rane committed to the reorganisation of the AIDS Control Society so that people living with HIV can be reached. He intends to focus on providing a better quality of life for children living with HIV. ‘I will work towards creating a better environment for them within the framework and funds that are available. I will be putting a monitoring committee in place with different NGOs and like-minded people so that I can deliver and do something to help the people living with HIV,’ Rane concluded. Human Touch is a youth led organisation in Special Consultative Status with Economic and Social Council of United Nations.